Sport a killer look this wedding season with fabulous silks, brocades, and net fabrics with delicate beadwork from Designer Fabrics, that’s just off Commercial Street. Another wedding season is upon us and if you are looking forward to be the belle of the ball, we recommend a trip to Designer Fabrics. Located on Lakshmana Mudaliar Street, diagonally opposite LB Prakash Tailors, Designer Fabrics will floor you with sheer range of fabrics - each prettier than the other. 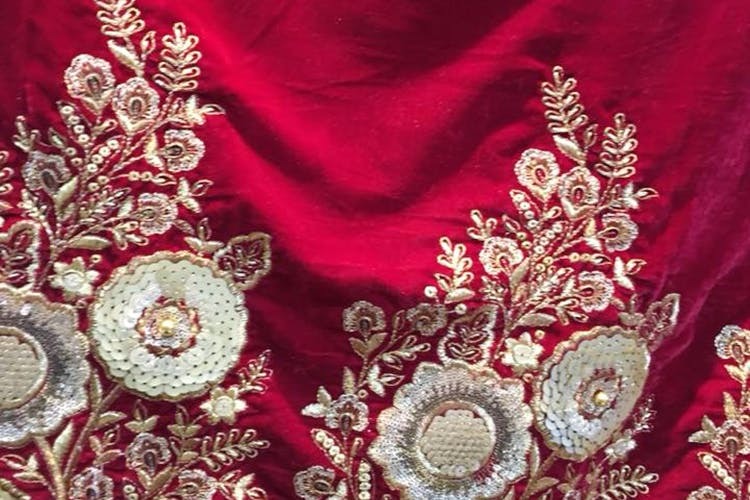 This store is perfect for those of you who love carrying off custom looks and is especially great to source fabrics for sparkly lehengas, chic kurtas and for wedding gowns too. You can browse through and pick from brocades done up in contrasting colours. You can also get them in golds, lime greens, and deep pinks. Another stack boasts of breezy chiffons so if there’s a beach wedding coming up, you can choose from retro prints or geometric patterns in blues, soft pinks, and bright yellows. When you are aiming for sophisticated and subtle, go for the designer silks. These come in understated golds interwoven with green, pink, and red threads. But for a little flash, turn your attention to the netted fabrics that come with delicate gold work. For brides, the fabrics brought in from Bangkok, featuring floral work done with beads are a great pick. Prices for fabrics start at about INR 450 and go up to INR 3,500. This is an end-to-end store so they offer tailoring services starting at just INR 450. You can also pick from their collection of laces and embellishments to add oomph to your designs.